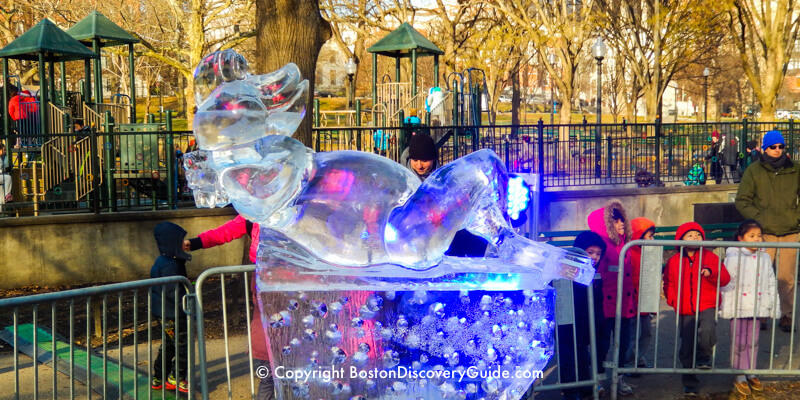 Looking for some fun Boston kids activities for the whole family to enjoy? Many are free, or offer discounts for kids and families. And as a bonus, many of these attractions are places you'll want to visit anyway. Go on a guided bike tour of Boston, or create your own by renting bikes for as little as 2 hours. Guide-led bike tours offer plenty of fun options for kids - and for parents, too. 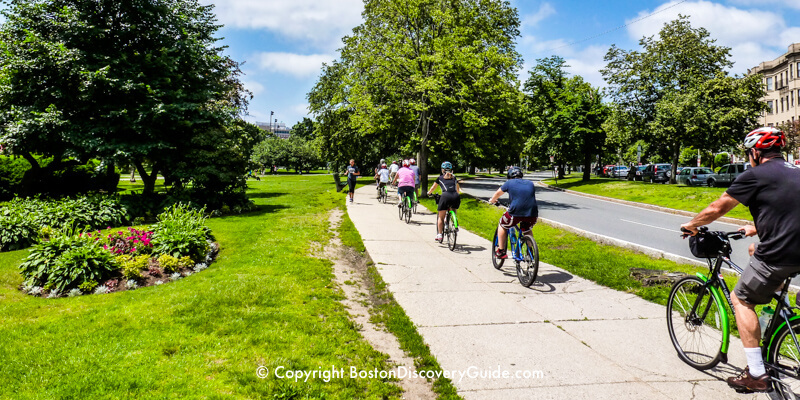 If you're considering the DIY route, the Boston Esplanade is a safe, easy place for kids to ride, and you can pick up rental bikes near the Feidler Footbridge overpass. Watch a Game with Your Kids! The Red Sox play their home games at Fenway Park from April through September/early October, and going to a game is a sure hit with most kids. But even if you're not here during Red Sox season,you and your kids can get a fascinating behind-the scenes view of the famous ball park by going on a Fenway Park Tour. Your guide will take you to different spots and regale you with interesting information about Fenway history, famous Red Sox players, and even current updates about the current team. 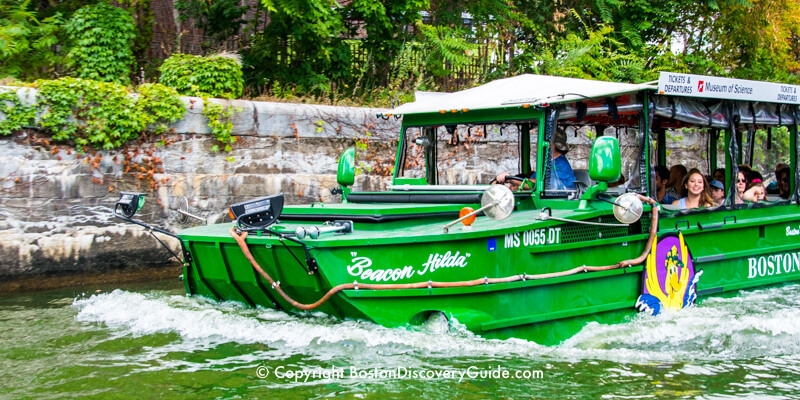 Start off your visit to Boston by going on a guided tour of the city in one of our famous Duck Boats. It's the best way to see the city plus the guides entertain you with funny stories about Boston history. The huge World-War II-style amphibious vehicles offer lots of family fun as you roll past many historic sites on land. But the fun really begins when you "splash down" in the Charles River! Depending on conditions, kids on board may even get the chance to steer the boat for awhile - have your camera ready! 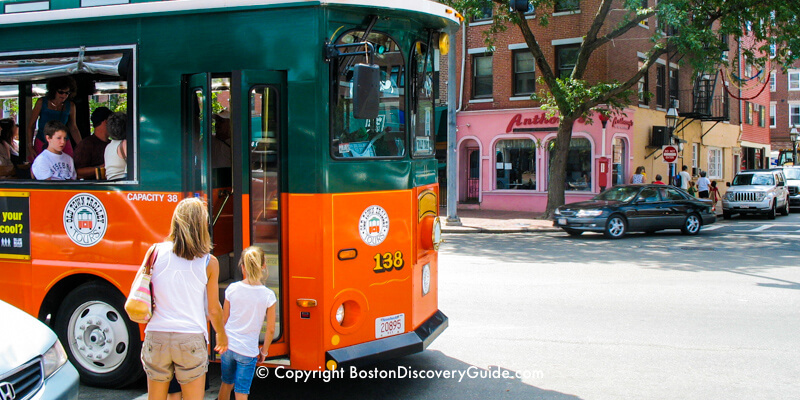 Another fun way for kids to tour Boston is on one of the colorful sightseeing tour trolleys. The trolleys' routes take you through some of the most interesting historic and contemporary parts of Boston. Younger kids simply enjoy getting on and off, while older kids and teens will be entertained by the driver's commentary. They may even learn something! 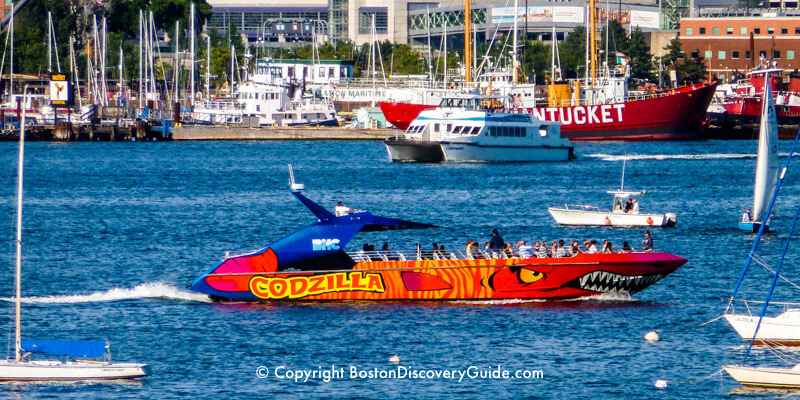 Ask any teen about which Boston Harbor cruise is the most fun, and you'll probably hear, "Codzilla"! You'll enjoy it too ... if you love loud rock music, fast turns, and a certain amount of wetness from flying water - or even if you just enjoy seeing your teenager have a thrilling ride. Your teens may moan and groan about having to sightsee with the family - until you mention you'll be doing it on a Segway. Definitely one of the coolest ways to get around Boston, and you'll be surprised by how much you'll see. 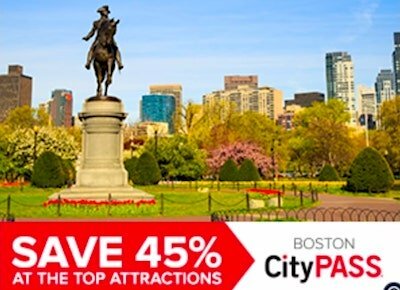 Compare Boston discount passes for savings on kids and adults admission to Fenway Park Tours, Duck Boat tours, Boston Harbor cruises, Museum of Science, and other top attractions, museums, tours, and cruises. Stop by one of Boston's specialty food markets (DeLuca's on Newbury Street in Back Bay and Charles Street in Beacon Hill, any small grocery or bakery in the North End, the Food Hall in Quincy Market) and scoop up some goodies. 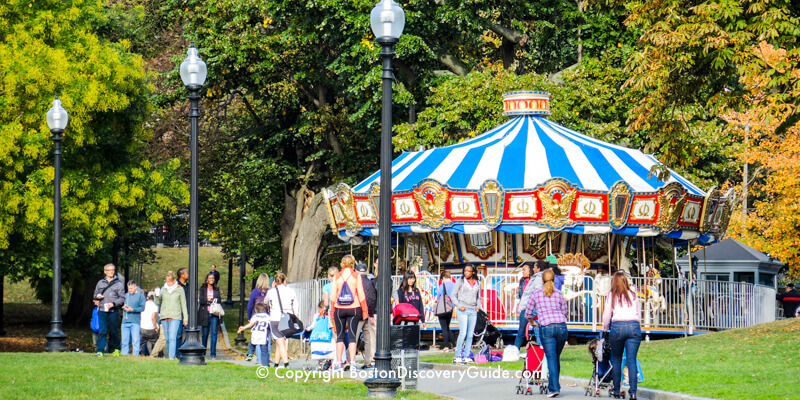 Head to one of Boston's many parks and green spaces - Boston Common, the Boston Esplanade, the Rose Kennedy Greenway, Christopher Columbus Park - and enjoy an impromptu picnic for one of the best Boston kids activities - and fun for the whole family. On Friday nights between 8:30pm and 10pm, head up to the roof of the parking garage at Boston's Museum of Science, where you'll find the Gilliland Observatory and other star-struck gazers. Knowledgeable museum personnel will help you use the computer-controlled, Celestron CGE 1100 Schmidt Cassegrain telescope during this free event. Nearest T station: Green Line/Lechmere. Kids (and parents) also love visiting the museum itself - you can easily spend an entire day here. Free entrance to museum with Boston discount passes. Teens may enjoy exploring the entire length of Boston's 2.5 mile historic Freedom Trail. If your children are younger, everyone may be happier if you pick a short section. 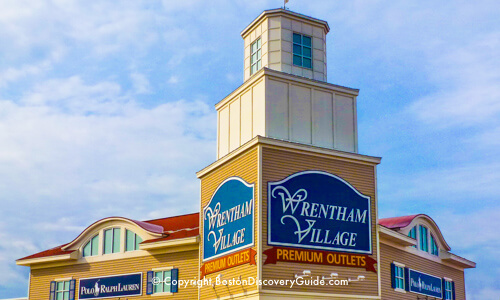 An approach that works well for the whole family is to pick a site you think your kids will like, such as the USS Constitution, add a nearby site that you want to visit, such as Faneuil Marketplace (who said you can't shop while soaking up some history?). Make everyone happy by stopping at Quincy Market or in a North End bakery for a treat. Blend together history and shopping by visiting popular Faneuil Hall Marketplace on Boston's historic Freedom Trail. Young kids love climbing around the base of the statue of Revolutionary War Patriot Samuel Adams, parents may long for a nice cold Sam Adams - and everyone loves exploring the shops. Don't forget to stop by the Food Hall in Quincy Market for lunch - or try one of the many other excellent restaurants in the area. The 6 glass towers of the Boston Holocaust Memorial, very close to Faneuil Hall, are dedicated to the memory of those who lost their lives in the Nazi concentration camps. Kids about 10 years old and up will find walking along the black granite path connecting the towers and reading the memorial plaques to be a moving and educational experience. Every year on December 16th, costumed re-enactors portray Colonial Patriots and Loyalists as they recreate the famous Boston Tea Party, the Boston protest that sparked the Revolutionary War. Your kids (and you) can watch the town debate leading up to the decision, and then join the procession to the Harbor to dump the tea. Enjoy sweeping 360 degrees views of Boston and beyond from the Prudential Skywalk Observatory on the 50th floor of Prudential Center or from the free observation deck at Independence Wharf. During summer months, you'll find free outdoor concerts popping up all over the city. From late June through early August, Boston Harbor Hotel on Rowes Wharf features musical performances on Tuesday, Wednesday, and Thursday evenings. The Institute of Contemporary Art hosts weekly evening concerts from late June through early September. Weekday concerts starting around noon can be found on many days in the Prudential Center, Copley Square, and Post Office Square. And then there are the biggest concerts of all, the annual Boston Pops Concerts and fireworks on the Esplanade. You can find free family-friendly concerts, festivals, and movies throughout the summer at the Hatch Shell, Boston's biggest outdoor stage located on the Boston Esplanade, just a short walk from downtown. Families with kids flock to the Free Friday Flicks series during summer months. For a couple of weeks each summer, the Commonwealth Shakespeare Company delights delights audiences with its free Shakespeare on the Common productions. Bring a blanket and a picnic, and enjoy these family-friendly productions under the stars on Boston Common. This is one of the top Boston kids activities - and fun for everyone. Visiting Boston during Winter Vacation Week with your teenagers, and want to ensure a fun trip? These top 10 things to do with teens in Boston during the winter will please your offspring - and be fun for you! 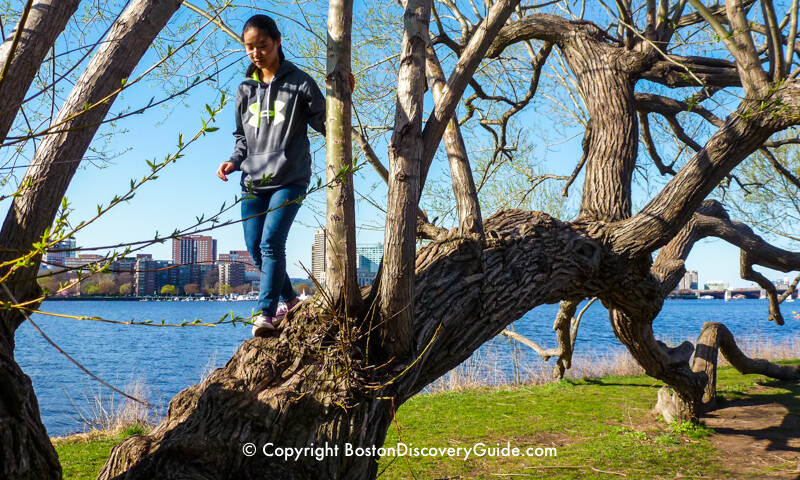 Without a doubt, you'll find the best climbing tree in Boston on the Esplanade, where older cherry trees with mostly horizontal branches reduce your chance of ending up in the emergency room. You'll also find several excellent playgrounds on the Esplanade. If you have kids or teens who will be filling out college applications some day, it's never too soon to start touring prospective campuses. With 60+ universities and colleges in Boston, Cambridge, and other nearby communities, you'll find plenty of interesting choices. And if you visit during the winter break, your future college student can get a taste of Boston's colder weather and decide if it's a "fit." Just a short ride on the Red Line from Boston takes you to Harvard Square, another world. Laid-back but bustling, filled with bookstores and interesting shops, Harvard Square is the perfect place to spend a few hours exploring with your kids. Walk around Harvard Yard, visit the Old Burying Ground (Mass Ave - Garden Street intersection) where Cato Stedman and Neptune Frost, African-American veterans of the Revolutionary War are buried, and stop by Burdick's (52 Brattle Street) for fabulous hot chocolate. During winter months, several Massachusetts ski areas within an hour's drive of Boston (plus other slightly farther away) offer downhill skiing, cross-country skiing, ski lessons, snowboarding, and more. For even more suggestions, check our complete New England Ski Areas Guide. During summer months, ferries leave several times a day from Long Wharf for the Boston Harbor Islands. Exploring historic Fort Warren, swimming on the beach at Spectacle Island, and examining life in tidal pools makes this one of everyone's favorite Boston kids activities. 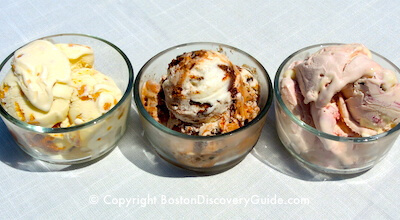 Head to the beach at Castle Island and go for a treat at Sully's. Or visit some of the other Boston beaches accessible by public transportation. Watch Free Movies at the Hatch Shell in July and August. Head down to the Boston Esplanade by the Charles River for free Friday flicks at 8pm on Friday nights. Kid-pleasing selections such as Kung Fu Panda and Star Wars make these family-friendly movies rank as a top Boston kids activity. Don't forget your blanket and bug spray. 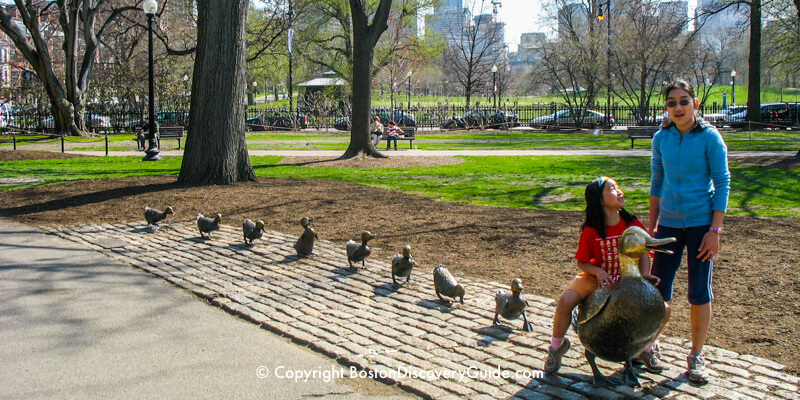 Every visit to Boston with kids should include the Make Way for Ducklings statues inspired by Robert McCloskey's classic book, Make Way for Ducklings. Child-scale bronze statues by sculptor Nancy Schön feature Mrs. Mallard and her 8 offspring: Jack, Kack, Lack, Mack, Nack, Ouack, Pack, and Quack. Visit for free, and take lots of photos - priceless! 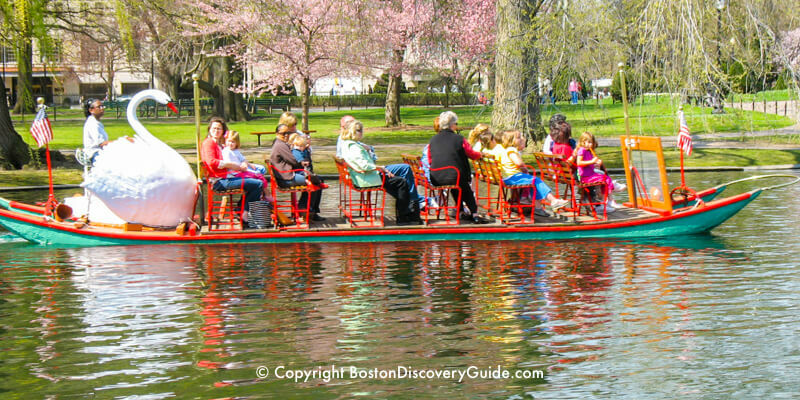 Both children and adults love the famed pedal-powered Swan Boats in the Lagoon in Boston's Public Garden. You'll even ride past the island where Mrs. Mallard brought her ducklings. Tickets are so inexpensive that you can go for more than one ride. Boston's Franklin Park Zoo is one of the favorite Boston kids activities, especially with the younger set. You can explore tropical rainforests, the Australian outback, and the African savannah and see tigers, giraffes, lions, kangaroos, and many other animals, birds, and insects in recreations of their natural habitats. Check Zoo New England for details. Stop by the outdoor habitat where seals live at the waterfront New England Aquarium. The habitat is really a large, deep tank with rocky outcroppings that mimic the seals native New England coastal home. You can watch the seals play all year round. Best of all, watching the seals play is free. Aquarium tickets are pricey, especially since kids who are 12 and older pay the adult rate. 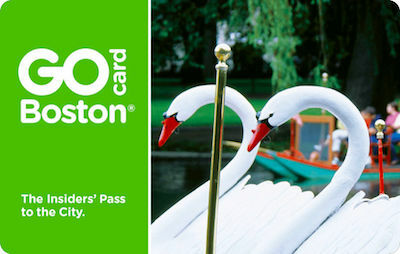 Fortunately, all of the Boston discount cards offer big savings - compare them to see which is the best value for your visit. Savings with the cards typically range from 15% - 55%. 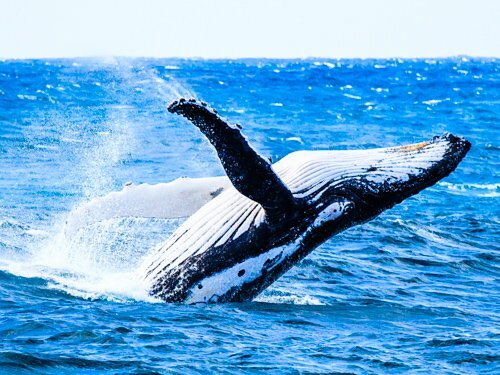 Learn about whales and other marine mammals from the naturalists on board Boston's popular whale watching cruises. You'll also enjoy the scenery as your boat takes you to Stellwagen Bank marine sanctuary. Do your kids enjoy ice skating? Boston and nearby Cambridge have several great rinks where you can rent skates and take a spin on the ice for a nominal fee. One of the most convenient is on Boston Common's Frog Pond. Some of the rinks also offer lessons. This is definitely a top Boston kids activity during the winter months. Frisbees are small and light to pack . . . so slip one into your suitcase. Tossing a frisbee on Boston Common is one of the best Boston kids activities - and adults can have fun and get some exercise too. The Rose Kennedy Greenway also offers lots of wide open areas perfect for frisbees, especially in the stretch near the North End. Don't let cold or rainy weather, summer heat and humidity, or even snow put a damper on your plans for family fun. Check out these fun inside Boston kids activities, including some of the city's top museums. You'll find a lot to do that's fun, even when the Boston weather is good. Disney on Ice comes to Boston almost every year during December and January, and then again (with a new show) during February vacation week to put on a spectacular performance on the ice at TD Garden. With a talented cast of amazing performers, your whole family will be mesmerized as the dancing and music bring all of your favorite Disney friends to life. Tickets sell quickly, so get yours now! Several Boston comedy clubs offer family-friendly shows. Improv Boston (actually located near Central Square in Cambridge) features many shows for all ages. During the weeks leading up to Halloween, attending their Gorefest: A Boatload of Gore show is one of the favorite Boston kids activities - actually, it's better for teens, as it is not recommended for the squeamish or the very young. Improv Asylum in Boston's North End offers some shows for ages 17 and up. 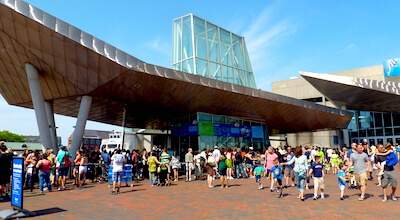 ICA Boston usually offers at least a couple of family-oriented events each month. Although they vary quite a bit, they usually involve interaction with contemporary artists, the chance to make some art, and perhaps dance performances, films, or hands-on graphic design. Some are free for up to 2 adults per family with children 12 and under, while others require a fee or paid museum admission. 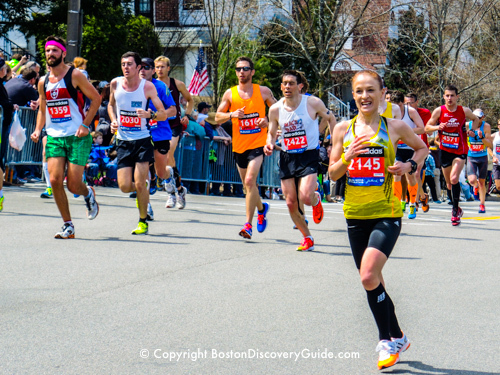 Use the GoBoston discount card for free admission. For Boston theater family fun, check out Blue Man Group, 3 bald blue-painted performers who perform a series of skits and funny pieces enjoyed by all ages. Teens and adults love Shear Madness, where the audience gets to help solve a pun-filled mystery set in a hair salon. Both shows are long-running favorites for Boston kids activities at the Charles Playhouse in the Theatre District. Boston movie theaters are alive and well, and you'll find a wide range of choices - everything from first-run commercial movies to foreign, classic, and indie films. Not all, of course, will be suitable for children, but you'll find many that are. The Boston Children's Museum provides lots of different spaces and activities where children from about 3 - 10 can explore the world around them - and learn things while they're at it. The spectacular South Boston waterfront location is just a short walk from South station. Check out $1 Fridays. If you have the GoBoston discount card, you'll get free admission. The two best children's bookstores in Boston are not in Boston at all, but instead can be found across the river in Cambridge: the Curious George Bookstore, and the children's section (actually, the entire bottom floor) of the Harvard Coop. They are both right in the middle of Harvard Square, and getting there couldn't be easier: take the T's Red Line to Harvard Square station, go out the main exit, and the Coop will be practically in front of you. Curious George is across the street to the left. Kings, located in Back Bay near the Hynes Center (50 Dalton Street) has a terrific bowling alley as well as lots of big screens with sports and a billiards room (pool tables). After 6pm, this popular Boston sports bar is strictly 21+. But before then, you and your age 6 and older kids can enjoy lunch and a fun afternoon knocking down the pins. The New England Sports Museum, located on 2 floors in TD Garden, features knockout exhibits dedicated to the Red Sox, Patriots, Bruins, Revolution, and Celtics. Harvard's Natural History Museum, located in Cambridge, will thrill your budding scientists as they explore the exhibits on animals, plants, and minerals. A few hours in this popular museum tops many favorite Boston kids activities lists. Everyone marvels at the famed glass flowers made by the father and son team of Leopold and Rudolph Blaschka. Free admission with most GoBoston discount card. One of the most popular Boston kids activities is visiting the Egyptian rooms in Boston's Museum of Fine Arts on Huntington Ave where their world-class collection of mummies is on display. You'll also see lots of other terrific exhibits - but what kids always remember are the mummies. Free with most Boston discount cards. 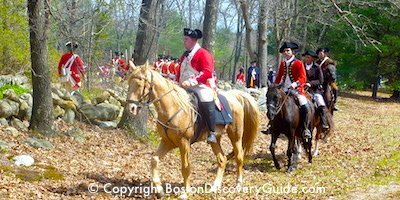 Watch Paul Revere and William Dawes race by on horseback during their famous midnight ride to warn Colonists that the British are coming, see local Minutemen and Militias gather on town greens, and smell the gunpowder from muskets as the first shots of the American Revolution are fired. Every April in Boston, Lexington, and Concord, reenactments of these key events in American history take place as part of our local tradition of remembering the heroic people and events that shaped our country's history. Check the Patriot's Day schedule for more details. Kids and grown-ups alike love Scooper Bowl, a 3-day all-you-can-eat ice cream and cancer fundraising event in June. Proceeds are donated to Boston's Jimmy Fund to support cancer research and treatments at world-renowned Dana-Farber Cancer Institute - so eat all the delicious ice cream you want without guilt. Boston's huge July 4th celebration actually starts a few days before the big event with HarborFest, an almost week-long commemoration of the fight for American Independence. Many sites along the Freedom Trail feature special events and activities especially focused on kids. 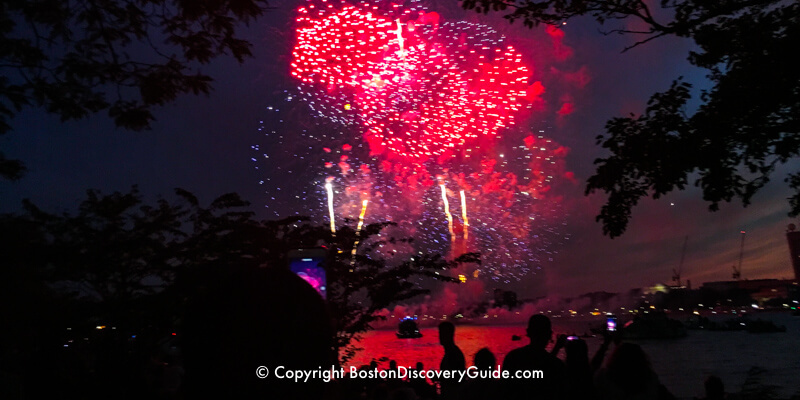 On the Fourth itself, the evening kicks off with the famous Boston Pops concert and entertainment, and ends with fireworks over the Charles River. Stake out your spot on the Esplanade or Cambridge side of the river, bring a picnic dinner, and relax with your family as you enjoy this epic Boston summer event. Boston's gala First Night celebration lasts from noon to midnight on New Year's Eve, with numerous activities, shows, ice sculptures, and other events sure to appeal to kids, teens, and adults. Come for just a few hours or stay the day - fireworks take place at 7pm and 12 midnight, and all official First Night events are free.